Horsham dates back at least to the C10, though no church is mentioned in Domesday Book and the oldest part of the original parish church of St Mary is C12. It is at the southern end of The Causeway, the mediaeval main street, and there is still parkland beyond it, despite modern expansion. By 1231, the nunnery at Rusper held the rectory of St Mary and about the same time Horsham is described as a borough (VCH 6(2) p131). It prospered as a market and administrative centre in the later Middle Ages, as it was by a crossing point on the river Adur. 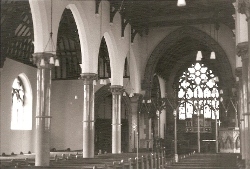 The area, centred on Carfax, north of The Causeway, was built up during this period, but it had no church until in 1840 St Mark was built. Despite later rebuilding, it was never successful and only the tower is left. In the C19 Horsham became a railway junction with new areas, for which churches were built (Holy Trinity (1879, rebuilt 1899) and Broadbridge Heath (1904). C20 churches have been built for further suburbs (notably St Leonard and a new St Mark in 1989) or as replacements (Broadbridge Heath in 1962).